In the Island of the Blue Dolphins, the main character relieves her loneliness by making friends with animals on the island, gradually coming to see them as companions rather than food sources. She tames a wild dog, raises birds and helps a wounded sea otter. 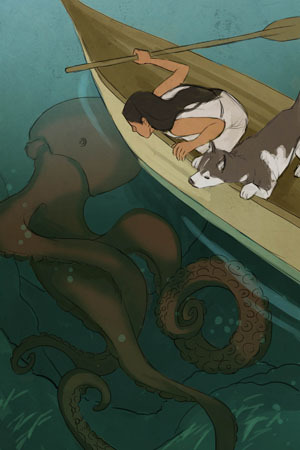 But then she sees this giant octopus lurking in the water and decides that she is definitely going to kill that thing. Just to show that she can. 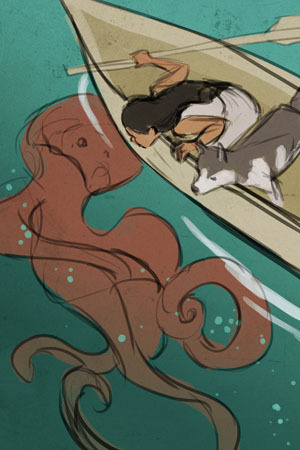 I just wanted the chance to draw a giant octopus. This was my first color comp. The colors are very pretty but they don't really give the feeling of the octopus being underwater. Pretty lazy of me, but it still helped the drawing a lot. I adjusted the dog's pose several times, trying to figure out what looked the most natural. I studied a lot of pictures of canoes and reflections in order to get the look of water to be convincing. 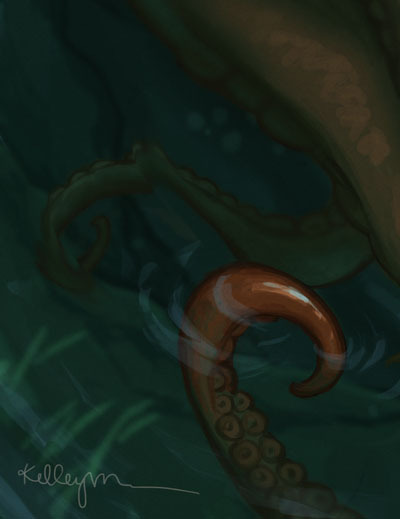 I blurred the parts of the octopus that were supposed to be deeper underwater, and used the smudge tool to create ripple-like distortions. 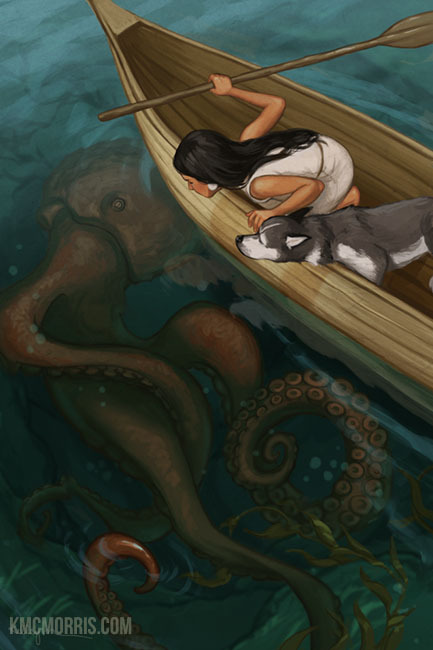 I think I nailed it, because I occasionally found myself searching for the "water" layer on my Photoshop file, as if there was an actual layer of water above the octopus! These are breathtaking! I am reading this book to my girls right now and JUST finished this chapter - it is so fresh in my mind that it is so exciting to see your art! Thanks! I love this! 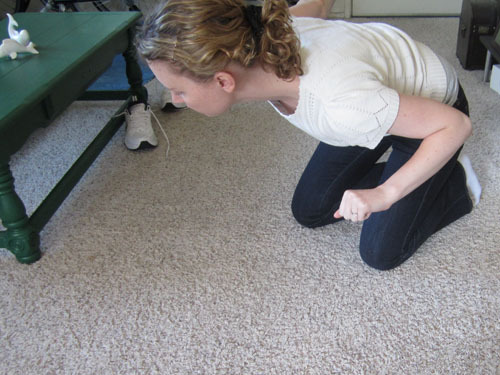 I was looking for pictures of the devilfish from Island of The Blue Dolphins to show my daughter what it may have looked like. We are both blown away. Helps our imagination. :) Thank you!